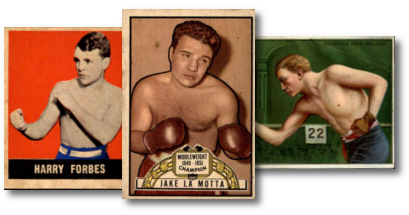 Dean's Cards offers a variety of boxing cards, including the 1951 Topps Ringside set, the most recent nationally-issued set of cards exclusively devoted to prizefighting. Dean's Cards always is interested in buying and selling vintage boxing cards. Click here if you want to SELL your boxing cards to Dean's Cards.